It's been a little over a month since I've been so moved or inspired by a piece of theatre. 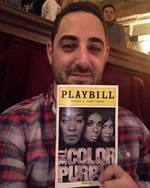 The Color Purple on Broadway shook me to my core! It was only intermission and I had already wanted to make plans to see this show again! Cynthia Erivo, Danielle Brooks, and the cast of "The Color Purple"Allee Willis', Stephen Bray's, and Brenda Russel's music/lyrics hit hard! I felt each word resonate within me. I love that this production is scaled down from the original Broadway run. It made me connect even more with the story and emotions running throughout the show. To watch "Celie" go from feeling like she was worthless to having so much self-awareness/esteem is something everybody can relate to. Cynthia Erivo gives it her all and then gives even more. She is fantastic as "Celie." She IS "Celie!" Her acting is equisite! Her voice is like no other! Her performance got deep under my skin. There is a reason "Celie" sings "I'm Here" and hearing Cynthia sing that song made me say, yes indeed, Cynthia IS here! I mean how many performers get a standing ovation midway through the show? Not many, but Cynthia deserved it! Jennifer Hudson and the cast of "The Color Purple"Danielle Brooks is terrific as "Sofia." I love Danielle as "Taystee" on Orange is the New Black, but seeing her in The Color Purple made me see her in a completely different light, showing off her acting chops in a way she doesn't get to demonstrate on Orange is the New Black. She has an amazing singing voice and her "Hell No!" has become my new anthem. To see Jennifer Hudson live on stage and hear that voice sing was pure delight! The whole cast is fantastic! They are one of the reasons I loved this show so much! From all their performances, I could tell how much each of them truly enjoy being in this show. Call Me Adam at "The Color Purple"The Color Purple is powerful! It's inspirational! It sends out a positive message about self love! It's a show everyone must see! The Color Purple plays at the Bernard Jacobs Theatre in New York City (242 West 45th Street, between Broadway and 8th Avenue). Click here for tickets and follow the show on Facebook, Twitter, YouTube, Instagram, and at http://colorpurple.com!